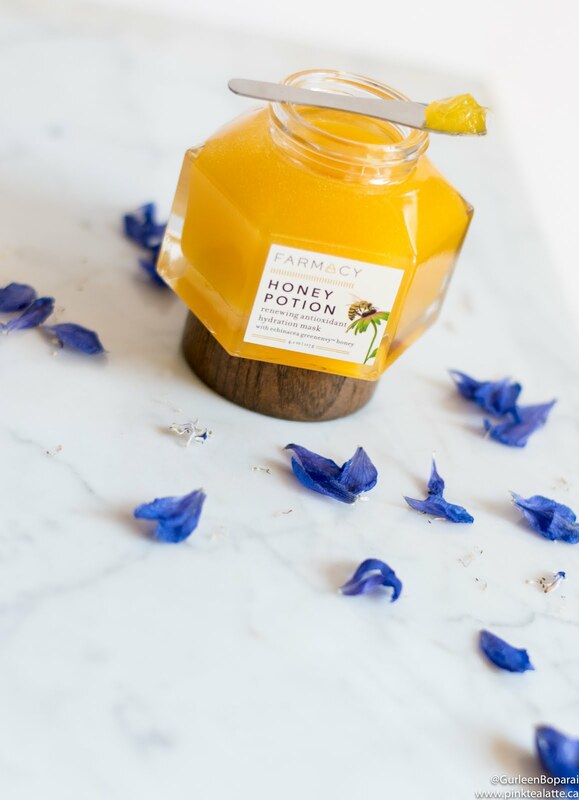 It is hard not to be tempted to pick up one of Farmacy Skincare's products because the packaging is gorgeous. How can you not love the chic hexagonal glass jars with wood caps. Also, I really just wanted the metal spatulas that come with a lot of their products because I have acne prone skin, so using the spatula in place of my fingers minimizes the amount of bacteria introduced into the jar. What I did not know until I got their products was that the caps have a magnet so the spatula will never go missing! YAY! 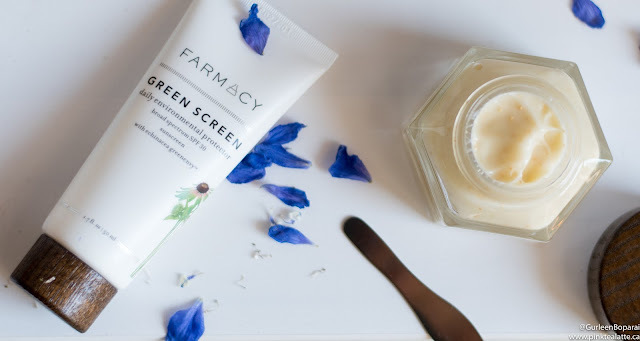 Aside from me being a sucker for pretty packaging, the New York-based skincare brand uses Echinacea GreenEnvy as the base in all of their products. The Echinacea GreenEnvy is a natural antioxidant that prevents enzymes from breaking down the collagen in your skin. I have used lots of face masks and consider myself proficient at them, so I tossed aside the instructions. 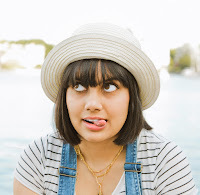 I scooped out a dollop of the shimmering gold product from the jar and began spreading it over my clean face. As I began smoothing it onto my skin, the semi-translucent gold mask started to turn opaque white. Not only that, it also got warm!Needless to say I scrambled for the instructions which confirmed that after working the mask on your skin, it will heat up and turn white in colour. I really enjoy this mask because with it warming up, it helps open up my pores; therefore, allowing the mask to sink in. It always leaves my skin feeling soft and smooth and I have found it very nourishing. I use it a few times a week and I still have a significant amount of the product to use, so you really do get quite a bit of use out of one jar. 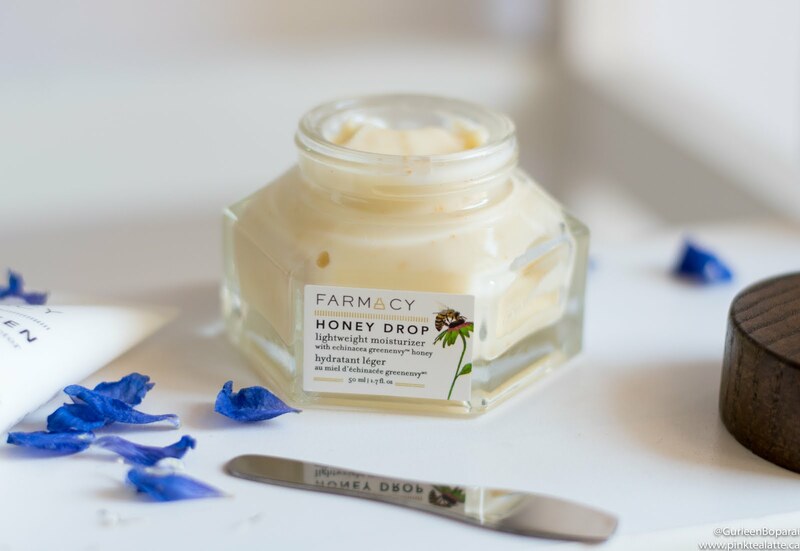 I am extremely picky when it comes to moisturizers, but Farmacy has really impressed me with their Honey Drop Lightweight Moisturizer. The cream is a good viscosity and is easy to apply over your face. It does not leave a greasy sticky feeling as it absorbs really well into your skin. There are also little tiny gold cupuaçu butter beads which is similar to cocoa butter. 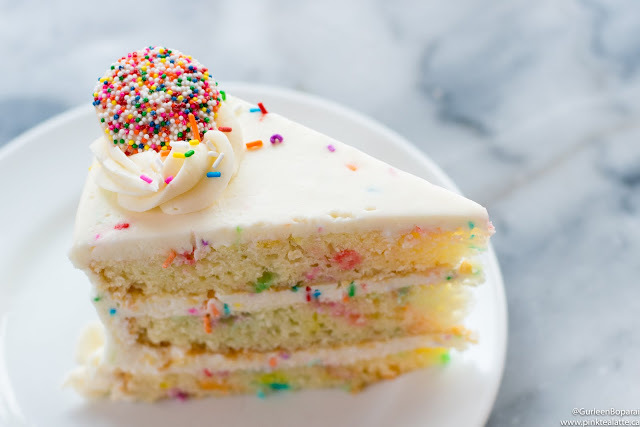 I also really love the overall colour of the cream, its a really lovely custard colour and I LOVE CUSTARD. I use the moisturizer twice a day, once in the morning and once at night. Since I do not wear makeup often, I enlisted the help of a friend to test out Farmacy's cleansing balm with me! She tested it out over the course of several weeks with a full face of makeup including waterproof eyeliner and mascara. Just like the moisturizer and mask, the cleansing balm came with a spatula which I always appreciate. The product was an unexpected pale mint colour and has a subtle citrus scent. We both agreed that only a small amount is needed to remove a full face makeup. I do not use waterproof makeup, but my friend who does suggested letting the product sit for 30 seconds to reduce the amount of tugging on your skin. It does a splendid job at removing all of your makeup and does not dehydrate your skin. 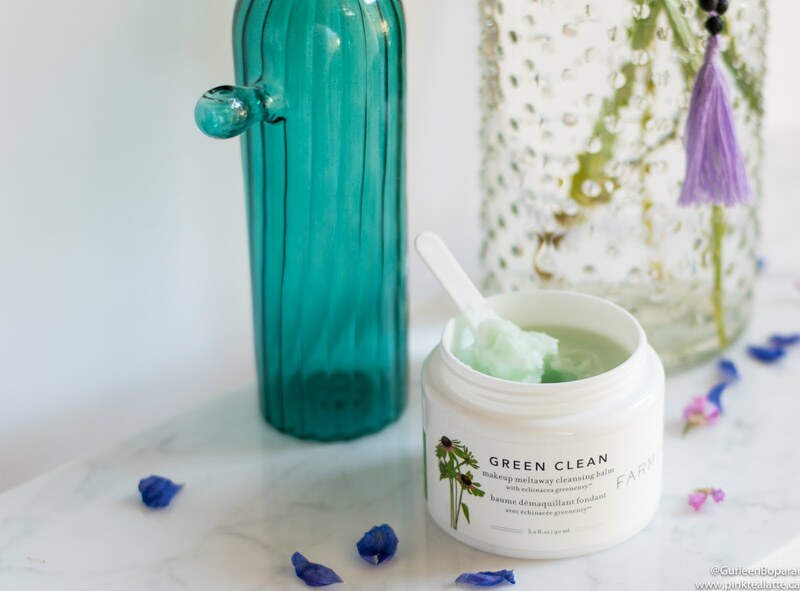 If you are looking for a new makeup remover, the green clean makeup meltaway is worth checking out. During the sunnier spring summer months, I use sunscreen daily, but get lazy in the fall and winter. I just have never been too keen on the feeling of sunscreen, so I use the dark dreary days as an excuse not to wear it. The Green Screen is rated a SPF 30 which is half of what I normally wear on my face. 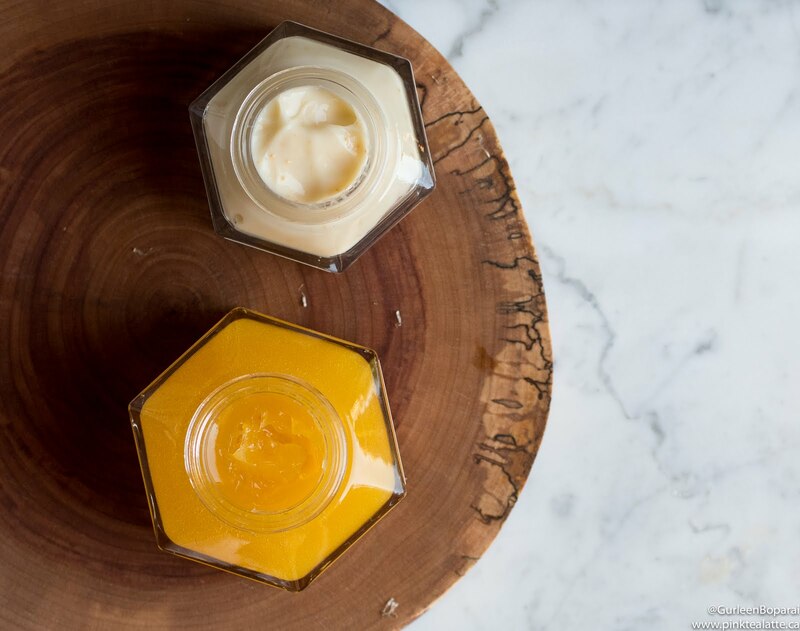 It has a thick consistency, but is easy to apply over your skin. Like all sunscreens, it does leave a slight sticky feeling. I mostly wear it on my body as I prefer to use a SPF 60+ on my face. I am really happy with Farmacy's skincare products and am really excited to try their other products. I will most definitely be keeping the jars as they are too beautiful to throw away.